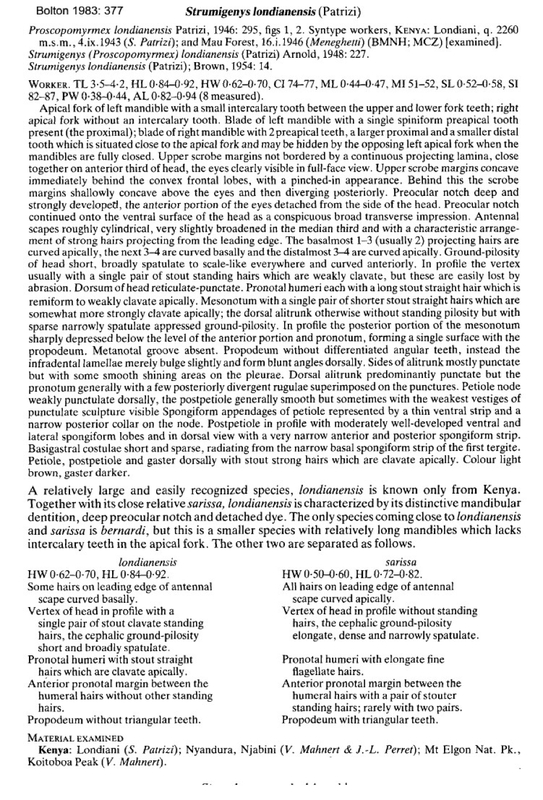 Type location Kenya (Proscomyrmex londianensis n. sp., Patrizi, 1946: 295, illustrated, worker; Bolton, 1983: 377, not illustrated) - paratype shown below . Patrizi's (1946) description is at . 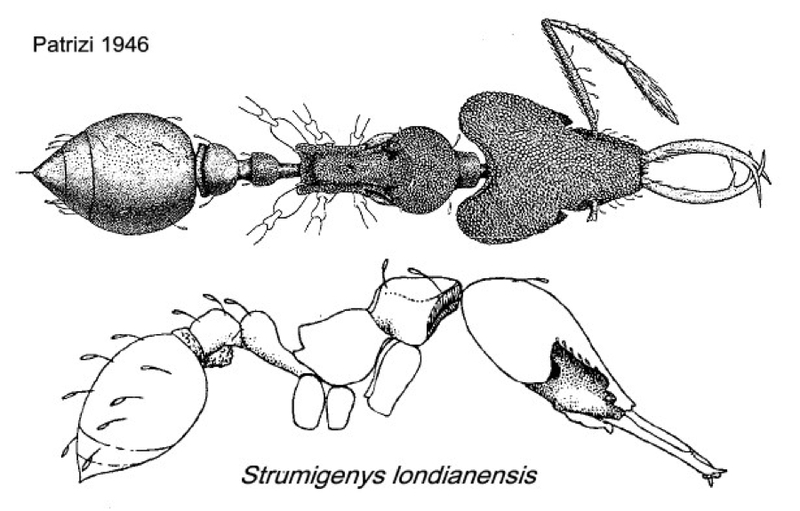 Brown (1954k: 14), as Strumigenys londianensis, gave notes, these are at . Bolton's modern description (1983) is at . The specimens from Tanzania, shown below, match Patrizi's description in all ways, including the overall size, TL ca 3.0 mm (not as Bolton stated 3.5-4.2 mm), but differ in having sharp triangular teeth on the propodeum. Curiously, Brown gave a paratype as size TL 4.2 mm, HL 0.88, ML 0.45, CI 75, MI 51. The Tanzania specimens do, in my view, support Patrizi's description, even though his drawings seem a little distorted. Bolton (2000: 602) is not available on HNS. His key added Ethiopia as a location. The photomontage of a paratype worker is collated from http://www.antweb.org/specimen.do?name=casent0900593. This is intermediate in size between the two Tanzania specimens shown below. The imaging does not show the denseness of sculpture on the head that Patrizi drew and my photographs show. The Tanzania specimens do have the stiff hair on the humeri but the erect hairs on the scapes all are curved in the same direction, that is posteriorly. The photomontage is of two workers from Tanzania; Uluguru Mts., western slope between Tchenzema village and Lukwangule Plateau, 2200m; collector V Grebennikov. Second set of two workers.